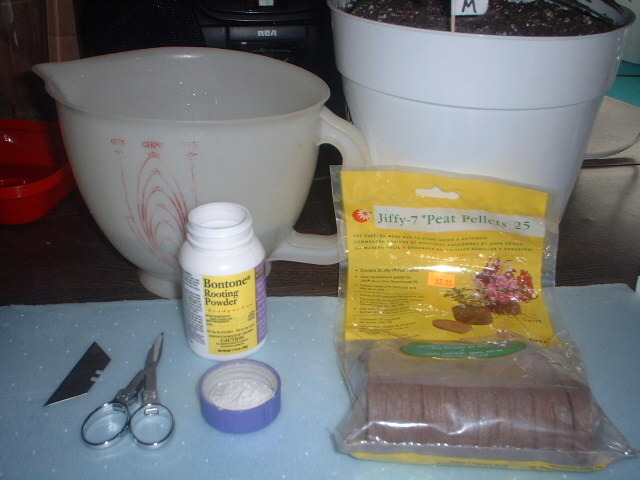 For those of us who like to play in the dirt, this is a very simple method of cloning, it has a high success rate, and anyone can do it with a little practice. A container of warm water. (Make sure you are using water with a neutral Ph 7.0 (I like reverse osmosis filters -- keeps the water clean and they're not too expensive). A pair of sharp scissors. Jiffy expandable peat pots -- another member tells me he prefers Rapid Rooters ?- choose what works for you. 10 oz. 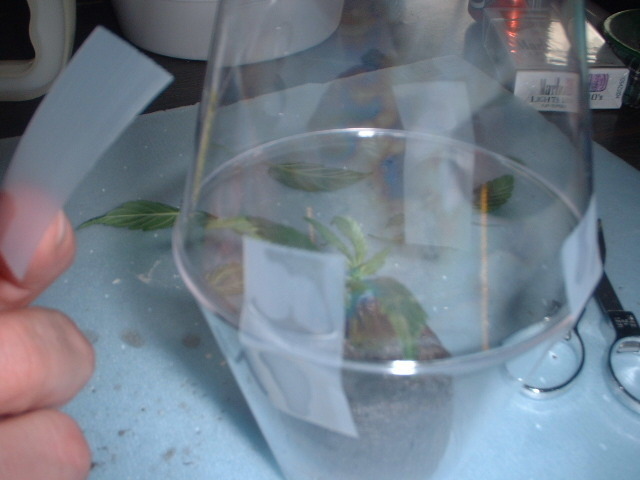 plastic cups (I use the clear ones so I can view root development and transplant without delay). A toothpick or small nail. 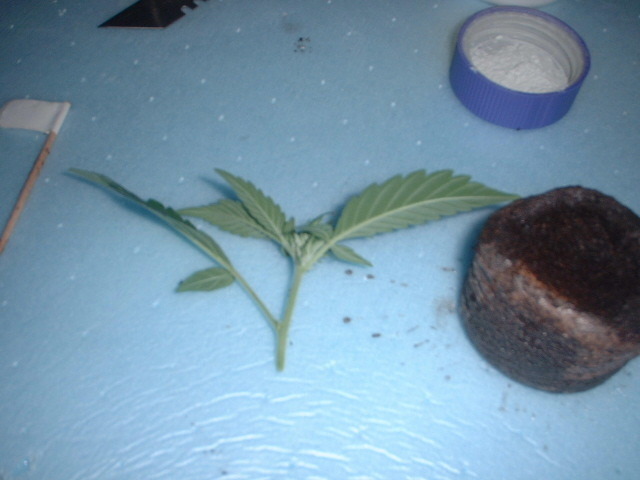 A healthy plant with viable clone sites. 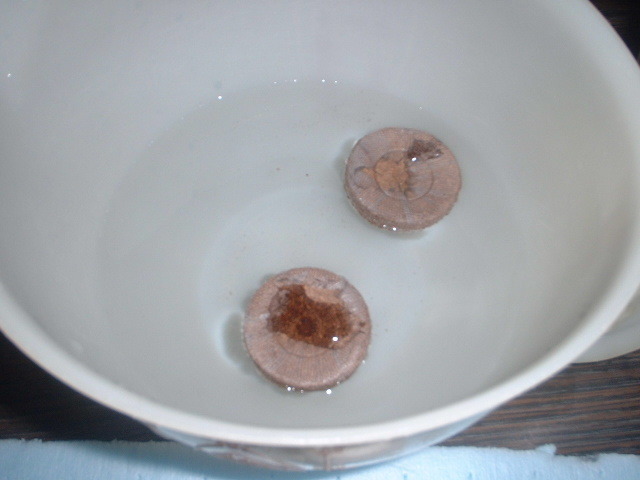 Place the expandable peat pots into your 7.0ph warm water until they fully expand. Before completely removing each one, gently squeeze the peat pot above your container to remove the excess water. Pick out where you want to take your clone from (I like to take clones that are at least two inches long) and snip it off with your scissors. 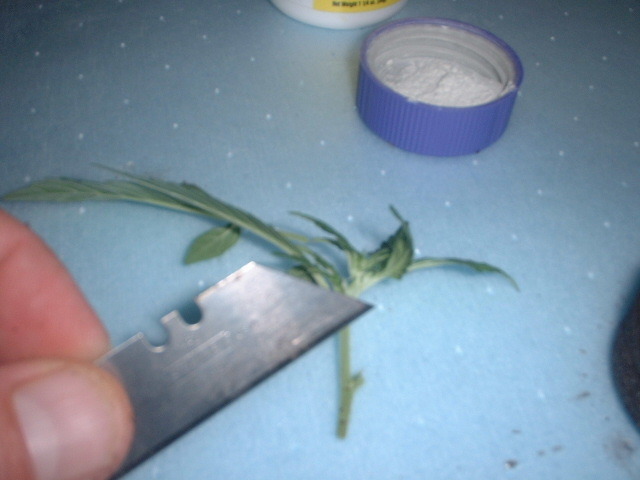 Remove the extra leaves until you have a little 'tree' -- the lower branch shown will be removed. Make a 45-degree angle cut at the base of your cutting, dip it in the water, and then into your rooting hormone. 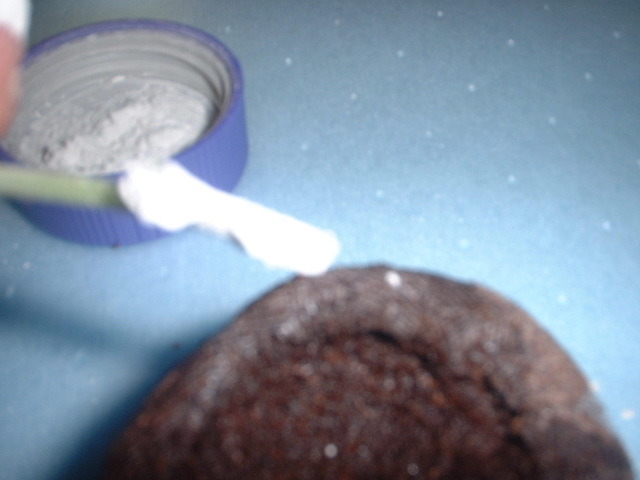 Using a toothpick or small nail, make a small hole in the centre of the peat-pot, no more than 1? deep. 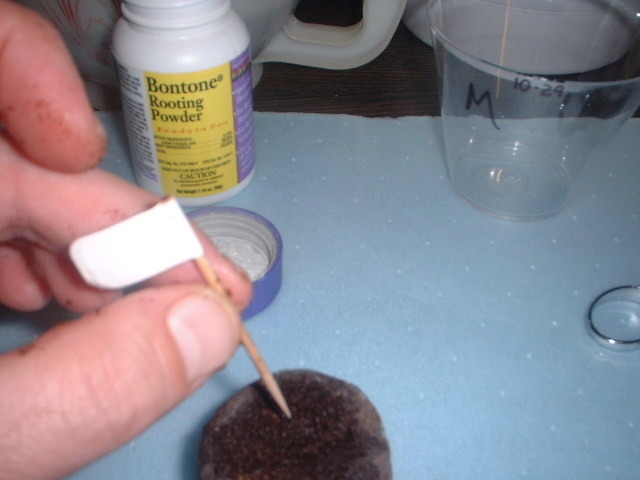 Gently, but firmly, Insert your dipped cutting into the peat pot until you feel resistance (make sure that you seat the clone as far down as it will go) and Pack the sides of the medium firmly around the base of your clone. Put the peat-pot and new clone into a clear plastic 10 oz. Cup. Use another (fix with your scotch tape) as the lid and it can join its sisters under the flouros. I have a couple of rectangular clone domes, but I rarely take that many at once. Using the individual cups allows you to take clones as you need them -- of course, this won't apply to commercial growers. It appears peat-pots aren't for everyone; some growers don't like them. 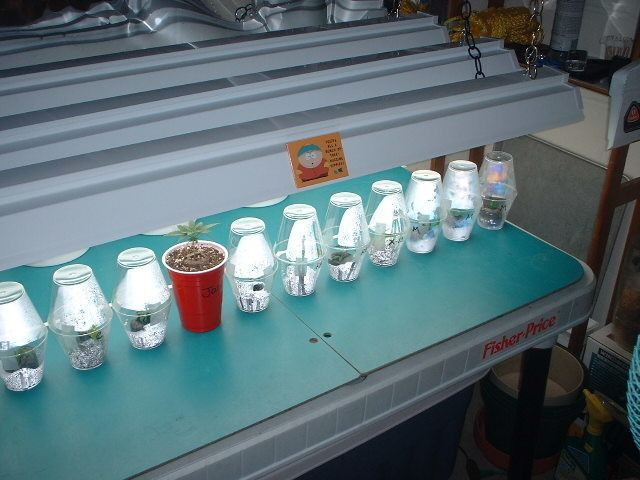 I do, they hold moisture until your clones root and once the clones are rooted, you can easily transplant to your next container. I like the clear cups because clones root at different times, the cups let me see the new roots as soon as they appear so I can transplant without delay and the top cup acts as a humidity dome. Marked, and labelled with the date I cloned it, I'll start to check for roots on day 8/9. Some of them may take as long as ten days but unless they wilt and fall over (if this happens increase humidity by misting the foliage) don't worry. 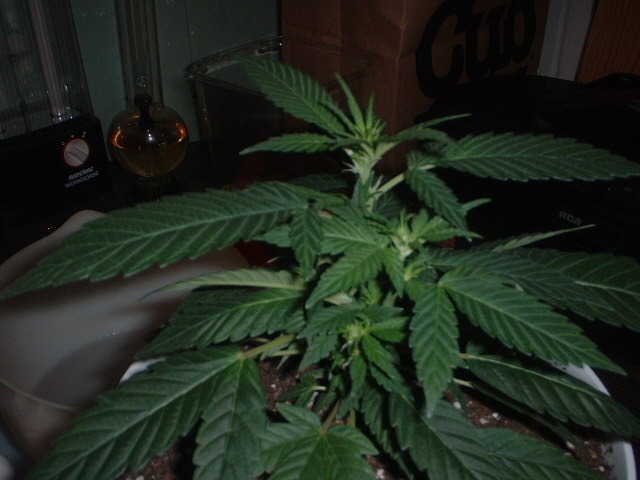 Yellowing of the leaf tips is common due to the plant using lots of energy to form new roots. Next time you want clones, try this simple method, and you'll be amazed at how easy it is!